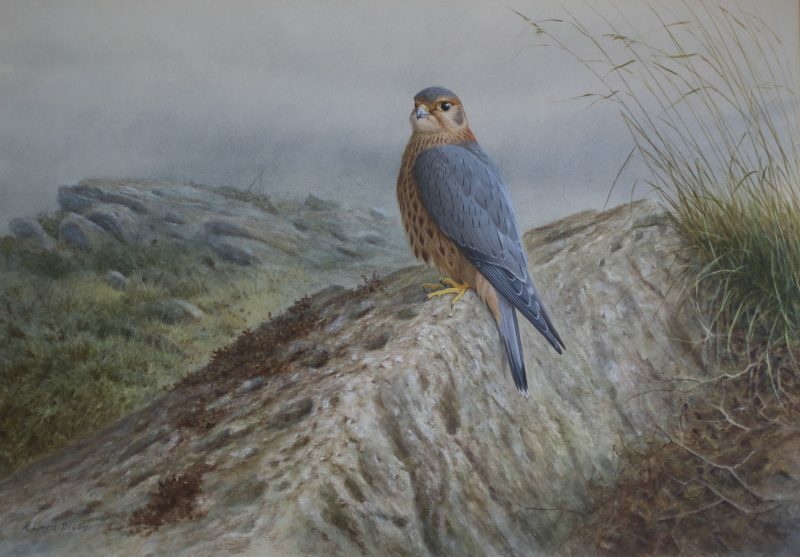 In 1950 Ron met David Reid-Henry, the well-known bird artist and falconer. This meeting was to permanently influence Ron’s way of life. The sight of a peregrine and other birds of prey on David’s lawn, along with his outstanding paintings at once captivated Ron. Ron now lives in an Old School House on the Dengie marshes where he still trains and flies falcons. Although he is now in his 80’s, he is still painting impressive works of art. In 1957, Ron became a member of the British Falconers’ Club, and is now an Honorary Member. Ron illustrated Tom Cade’s 1982 book, the Falcons of the World, with 44 paintings His illustrations can also be seen in Hal Webster’s 1988 Game Hawking… At Its Very Best, Beebe and Webster’s 7th, 8th and 9th editions of North American Falconry and Hunting Hawks, Volume 1 of The Birds of the Thai-Malay Peninsula, 1999, by David R Wells and the 2005 revised editions of A Falcon in the Field and A Hawk for the Bush by J.G. Mavrogordato and Artist Falconers: The Falconry and Raptor Art of David Morrison Henry and Ron David Digby. Much of his work is currently illustrated in the book “The Complete Merlin”, The Merlin and Red-Headed Falcon in Falconry.